Bear River is a small clear slow moving river in the northwestern lower peninsula of Michigan. It is the largest tributary of Little Traverse Bay in the northwest of the lower peninsula. The river has its headwaters in Walloon Lake on the boundary between Charlevoix County and Emmet County, draining from the southeast end of the lake near the community of Walloon Lake in Melrose Township. M-75 has its northern terminus in a junction with US 131 nearby. 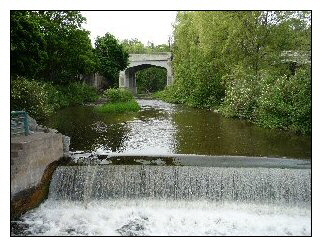 The river flows east for about two miles before turning north through Bear Creek Township, angling northwest to empty into Little Traverse Bay in Petoskey. Petoskey was at first known as Bear River until being renamed in 1873. It is approximately twelve miles overall and has excellent fishing. It is also very peaceful canoeing or kayaking. The river is great for smelt fishing. For most of its path in Emmet County, River Road and the Tuscola and Saginaw Bay Railway parallel the river on its west banks.